Believe it or not this happened once before. You may think that nothing like the multiplication of perfume niche companies has ever been seen in the history of scent sales but back in the early twentieth century something very like this happened. When the sea and the sky get into the informal partnership we like to call a hurricane, it seems like all heck’s broken loose. Here in Jersey, we’re used to heck breakin’ loose. Heck, we often break it loose ourselves. This last week’s meteorological event had our full attention. We even stopped watching Bravo. In musing over the reasons why chypres are no longer in fashion, I’ve come up with an argument predicated on taste-buds. If the oriental is all about the sweet and the resinous, maybe the chypre is all about the salt and the woodiness. It’s that same division in taste you notice between people who can’t pass an ice cream parlor and those who can’t pass a deli. I belong in the latter group myself. One of my great loves is a good deli, and the best thing in life is a really good pickle and really good potato chips. 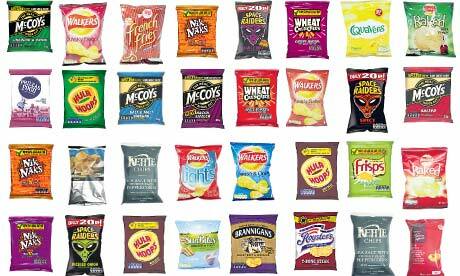 The British adoration of crisps in a wide panoply of flavors is completely comprehensible to me. Barbeque, Salt’ n’Vinegar, Chicken Vindaloo… bring it!